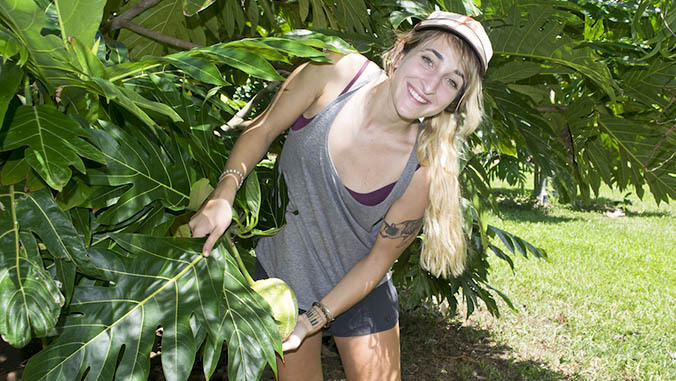 Got ʻulu Noa Lincoln, an assistant researcher in the University of Hawaiʻi at Mānoa, has launched a new citizen science project asking volunteers to help build knowledge about breadfruit. Coordinated by graduate student Blaire Langston, the campaign invites members of the community to “adopt” a local ʻulu tree and observe its lifecycle events. Learning more about this under-studied tree will help localize food production by supporting breadfruit as an emerging crop in Hawaiʻi. Citizen scientists are encouraged to visit the ʻUlu Phenology project website and create a profile of their chosen tree. It does not have to be on the owner’s property—it can be at a church or school or in a public place, as long as it’s planted in the ground and growing somewhere easily accessible. Participants are asked to submit observations of the tree every two weeks, whether online, by email or by phone. ʻUlu is valuable in terms of food sustainability because it makes so much food—up to 350 pounds per tree. However, it is also a seasonal crop, with each tree fruiting one to three times a year. If all the trees were on the same cycle, this would lead to periods of market glut followed by times of scarcity. It is possible to modify the fruiting cycles to some extent by planting trees in different areas and under different growing conditions. “Phenology” in the ʻUlu Phenology project refers to the timing of biological phenomena such as fruiting, flowering, especially how they change in relation to climatic conditions. Citizen scientists will record their observations of when flowers appear and drop, when fruit emerge and ripen and fall. Lincoln and Langston, both in the College of Tropical Agriculture and Human Resources, will coordinate data with information about the areas where the adopted trees are growing, such as elevation, rainfall patterns and soil types. At the end of the three-year study, the information will be made publicly available to support efforts in breadfruit production. Regional and statewide phenology maps will be created, to help growers better understand when ʻulu in different areas and under different conditions are likely to fruit. They will be able to coordinate efforts to ensure a consistent supply. Breadfruit are very sensitive to climate, and having a record of their phenology changes will be helpful in tracking climatic changes. For more information, contact Lincoln at nlincoln@hawaii.edu or Langston at blairej@hawaii.edu.